Hot Springs, NC is an Appalachian Trail Community that sits along the French Broad River in the Appalachian Ranger District of Pisgah National Forest. The Appalachian Trail was built through Hot Springs more than seven decades ago, and today white blazes still mark the path through town and over the bridge across the river, before heading north up to the vista, Lover’s Leap. The AT is unequivocally intertwined with the town — it is the first town, headed on a northbound hike, through which the AT literally overlaps the town’s main street. This brief, but testy, 2.5-mile loop will take you to Lover’s Leap for a picturesque overlook of Hot Springs, the French Broad River, and the tall mountains that surround the valley. My brother Dave and I visited Hot Springs on Wednesday, May 6, 2015 from 9:00AM to 10:30AM. Our plan was to climb the Silvermine Trail to the junction with the Appalachian Trail, check out Lover’s Leap, then descend back to town on the AT. Hike Rating: Moderate. Somewhat strenuous climbing to the junction with the AT. Trail Condition: Mostly good. The spur to Lover’s Leap is slippery with loose rock. Starting Point: Silvermine trailhead across the bridge east of Hot Springs. Trail Traffic: We encountered more than a dozen Appalachian Trail thru hikers. How to Get There: Hot Springs is located on US Hwy 25/70 about 26 miles west of the junction with I-26 in Weaverville, NC, or 6 miles east of the Tennessee state line. Immediately before crossing the French Broad River turn right onto SR 1304. Turn left at the first intersection and follow signs to the Silvermine trailhead parking area. If coming from Hot Springs, cross the river, then take the immediate left on SR 1304. This trailhead was a little bit hard to find. Everything was cool with the directions above through “turn left at the first intersection.” After that I got confused. There is a large parking area beside the French Broad River for the Nantahala Outdoor Center. That parking lot is right beside where the Appalachian Trail exits the forest. This point actually turned out to be the end of the hike. The Silvermine Trailhead is farther up the road, past several homes, across a small stream. Just keep going. You’ll find it. Once situated in the right place, Dave and I began the somewhat steep ascent of the Silvermine Trail. Since this was the first week of May, the wildflowers were plentiful, including the first mountain laurel of the season. After a little less than a mile, the Silvermine Trail meets the Appalachian Trail as it comes down from the ridge above. For a longer hike, continue northbound on the Appalachian Trail to Tanyard Gap where the trail crosses Hwy 25/70 about three miles away by car. It’s a challenging uphill hike of nearly six miles. For this hike, though, we took the southbound fork. This point is also the first of three overlooks of the river valley more than 400 feet below. Almost immediately, we began encountering Appalachian Trail thru hikers coming up in the opposite direction from us, beginning their new day after a night in Hot Springs. Most seemed in good spirits… always a positive sign. Less than half a mile later we reached a short, but difficult, spur trail to Lover’s Leap. It was obvious from the rocky outcropping at the end of the promontory. Seeing it was one thing. Getting there was another. The spur trail was covered with loose dirt and pebbles, making it quite treacherous to maintain footing on the very steep descent. We both slipped on the way down, but made it to the overlook without any permanent damage. The view was (is) spectacular. The French Broad River flows 218 miles from near the town of Rosman in Transylvania County, North Carolina, into the state of Tennessee. Its confluence with the Holston River at Knoxville is the beginning of the Tennessee River. The river flows through the counties of Transylvania, Buncombe, Henderson, and Madison in North Carolina, and Cocke, Jefferson, Sevier, and Knox in Tennessee, and drains large portions of the Pisgah National Forest and the Cherokee National Forest. It is the third oldest river in the world, older than the mountains it passes through. It is so old, in fact, that it is practically devoid of fossils. This view looks south from Lover’s Leap. Past Lover’s Leap the Appalachian Trail descends in earnest until is meets the French Broad River. The last half mile of the hike is along the riverbank, where we found numerous tents of those thru hikers who had not yet resumed their journey. These were the ones missing the positive glow of those thru hikers we had seen earlier. Here there were more surly faces and hunched shoulders. The AT will take a toll. There are shoals in the river that create occasional whitewater, and you will pass an old gauging station that used to measure water flow. Soon after we popped back out of the woods at the Nantahala Outdoor Center parking area I mentioned before. We completed the loop back to our car on the road we came in on. There isn’t much to this hike, about 90 minutes for us, and we dawdled quite a bit to chat with the AT hikers. As long as we came all this way, we crossed the bridge into Hot Springs to look around. In the heart of Hot Springs is the 100 acre Resort and Spa. Natural hot mineral water is heated deep within the earth and pumped to the surface. This crystal clear carbonated water is world renowned for the mineral content and legendary healing powers. If pampering is your thing, then this may be for you. Not only does the AT run right through town, you can also find whitewater rafting, tubing, mountain biking, horseback riding, fishing and, of course, additional hiking. Hot Springs has quietly placed itself on an area smaller than a city block, yet offers adventurers more than enough to keep busy. Hot Springs has many rental cabins where you can enjoy the beautiful Appalachian scenery from a porch, completely surrounded by the woodlands of Pisgah National Forest. 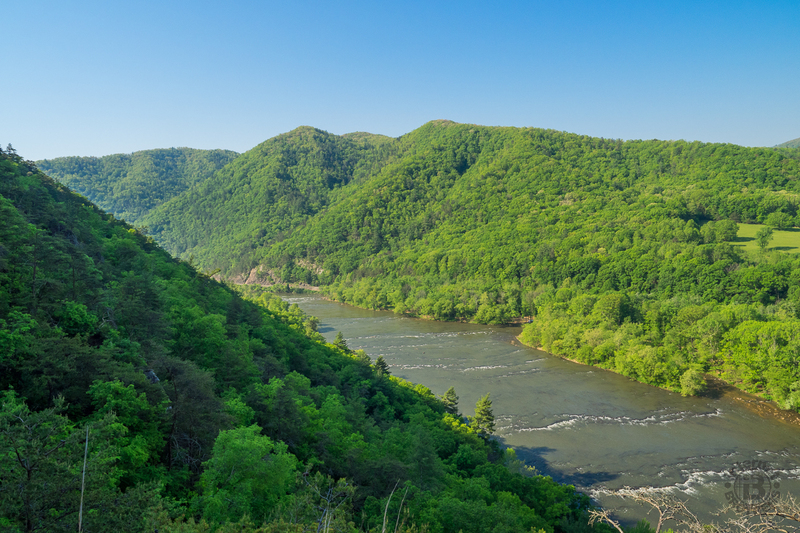 If you have a morning to kill, why not take a visit to Hot Springs, and hike the famous Appalachian Trail to Lover’s Leap. Mountain laurel on the A.T.